13-year-old Charlie Finlayson stepped up to save his dad's life after his father was hit by a refrigerator-sized boulder during their camping trip - all alone. On August 17, Charlie and his 52-year-old father, David Finlayson were enjoying a day of backpacking and climbing near Ship Island Lake in the Bighorn Grags in Idaho, an area known as "River of No Return Wilderness." Then the trip took a horrifying turn when a boulder rolled off the mountainside and struck David, sending him careening 30 feet down the mountain. He was briefly knocked unconscious, sustaining a broken back, left arm, and left heel, as well as a severe cut on his left leg that exposed bone. With the nearest ranger station 13 miles away, it was up to Charlie to take care of his father. For two days, the 8th-grade Boy Scout kept his dad calm, fed, and hydrated. He also cleaned and dressed David's wounds, and used sleeping bags to help keep him warm. After walking around Ship Island Lake every day looking for help, it became clear that Charlie would need to venture further. 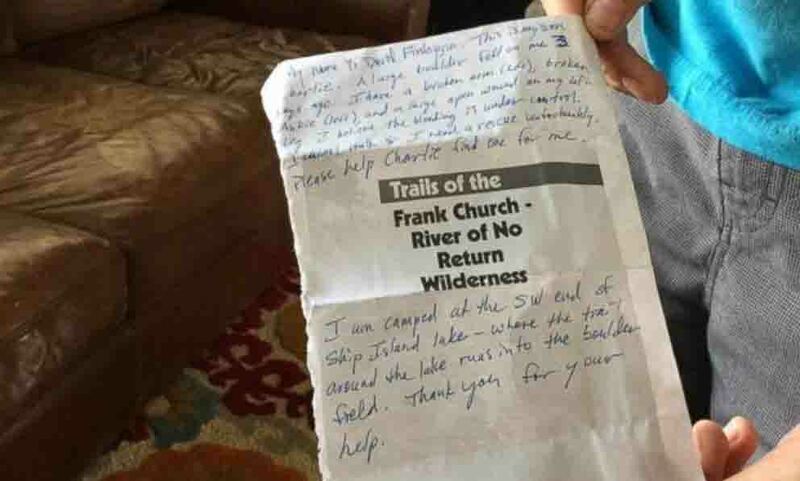 On the third day, he embarked on the 13-mile hike to the ranger station, carrying a 40-pound backpack and a note from his dad explaining what had happened and how to find him. "He was my savior," David told the Idaho Statesman. "He kept talking to me all night." According to Charlie, leaving his father was the hardest part. "I was scared I wasn't going to find somebody," he said. "I prayed a lot." Fortunately after three miles he found a few men who offered to help, and ultimately his father was airlifted to a hospital. "He did a good job," said David. "He's been climbing and backpacking with me for years … He had a lot of training." As for David, he's doing better now — and apparently, it's not too soon for jokes. "We had a pretty solid relationship with each other before this happened," he said, "but it's definitely concrete now… Or granite, maybe, is the way to put it." He is such a BRAVO!